My mom is a high school principal and English teacher, and from time to time she uses film clips in her classes to liven things up. Her American Lit students are doing a unit on the Revolution, so the other day she asked to borrow my DVD copy of The Patriot, intending to show a scene or two just to set the mood. To her surprise, the students really got into it, and they ended up watching quite a bit. Very few of my fellow Rev War buffs seem to share my positive view of this film. In fact, several years ago I attended a fine symposium on the Revolutionary War in the South, and one thing shared by practically every attendee with whom I spoke was a strong dislike for this movie. The chronology is warped beyond all recognition. The film begins sometime around the run-up to independence, then jumps forward to the fall of Charleston. This places most of the action after May 1780, but a subsequent montage seems to show the much earlier encampment at Valley Forge. Furthermore, the DVD menu identifies the climactic battle as Cowpens, which took place in January 1781, but a bit of dialogue places this sequence in October. That last battle merits some additional attention. 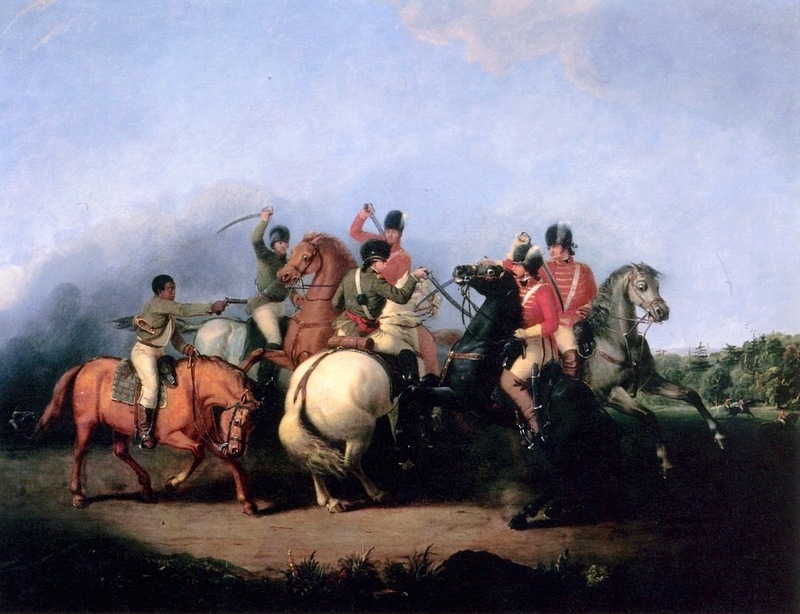 Although it’s supposedly Cowpens (depicted here in a rather inaccurate painting), it bears a closer resemblance to the larger battle at Guilford Courthouse. Cornwallis is in command during this sequence, but he was not present at Cowpens. Nor was Nathanael Greene, who is depicted leading a council of American officers on the eve of the battle. The film’s Greene also seems to have a southern accent, while the historical Greene was from Rhode Island. An earlier sequence depicts the American defeat at Camden in August 1780. In the film, this battle unfolds across a picturesque open field. The actual engagement took place in a swampy, wooded area. Furthermore, the movie’s Continentals flee this battle en masse; in actuality, the militia ran in the face of British bayonets, abandoning the Continentals under Johann de Kalb. On a side note, de Kalb’s wounds in the battle cost him his life, and his remains lie in a Camden churchyard. On my first trip there in 2001 I visited his grave, and was surprised to find a small movie theater just down the street where The Patriot was showing. It’s a small world. Mel Gibson’s Benjamin Martin character is a mish-mash of several backcountry commanders. 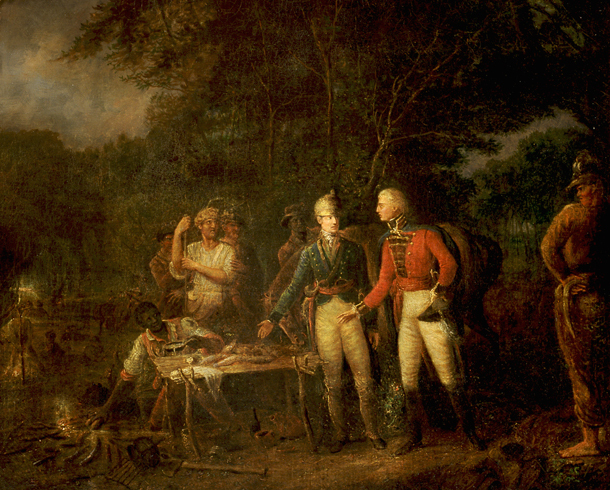 The most obvious parallel is Francis Marion, visible in the center of this painting. An early draft of the script actually had Marion as its star. Like Marion, Martin is a partisan commander who takes refuge in the South Carolina swamps. Martin loses a son named Gabriel in battle; Marion lost a nephew by that name. Yet Martin also bears a similarity to Thomas Sumter, who took up arms when British troops burned his home. Martin commands the militia at Cowpens, a role performed in actuality by Andrew Pickens. At the same time, he devises a defense in depth, with the militia firing two volleys before retiring to the rear. Here Martin becomes a fictional Daniel Morgan, the rough-and-tumble commander whose skillful use of militia and regular troops at Cowpens ended with a tactical masterpiece. For an eighteenth-century planter, Benjamin Martin is a pretty progressive guy when it comes to race. He owns no slaves, relying on free blacks to work on his farm. When a slaveowner signs over one of his laborers to serve in the militia, Martin insists that the slave sign up for himself. In actuality, Thomas Sumter used the confiscated slaves of Tories to pay enlistment bounties. 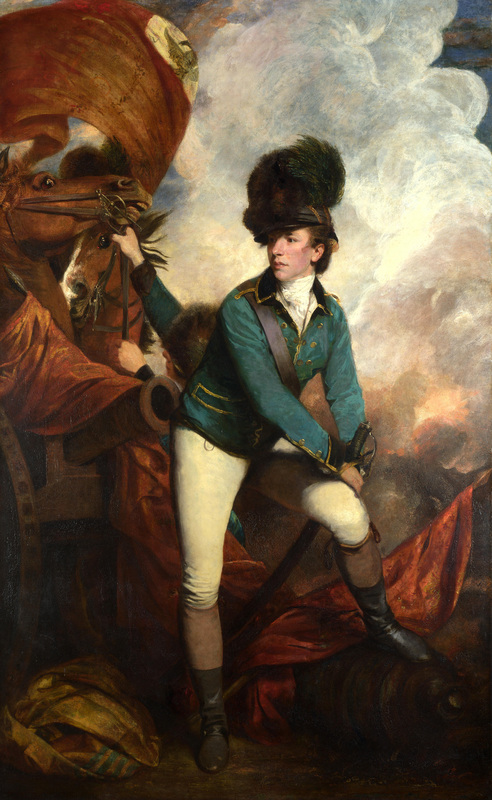 Col. William Tavington, the film’s villain, is obviously based on Banastre Tarleton, the notoriously aggressive young commander of the British Legion depicted in the portrait at right. Tarleton’s unsavory reputation in the Carolinas is the stuff of legend today, and made great fodder for American propaganda at the time. Compared to his fictional counterpart, however, he was an absolute Boy Scout. Tavington shoots a young boy in cold blood, burns civilians alive in a locked church, and (in a deleted scene available on the DVD)supervises the torture of captured American militiamen. Tavington dies a particularly unpleasant death at Cowpens/Guilford. Tarleton’s independent command at the real Cowpens was a disaster, but he survived, and in fact was one of the few British soldiers to escape the field. He suffered a nasty hand wound at Guilford but served through Yorktown, returning to England to live to a ripe old age. Although he never again saw active command, he was made a general in 1812. In the film, Cornwallis and Tavington keep up a running feud. In reality, Cornwallis relied heavily on Tarleton during the Carolina campaigns of 1780-81 and lavished him with praise on numerous occasions. In other words, The Patriot takes place in a wartime South Carolina that’s similar to, but hardly identical with, the real thing. To me, that’s no big deal. Dramatic works operate by their own logic. We judge them based on whether they’re credible, not whether they’re factual. It’s only when their creators present them as “the truth” that they become legitimate targets for this type of criticism. Screenwriter Robert Rodat slapped the “based on a true story” label on the script draft mentioned above, but the finished movie makes no such claim. In fact, by changing the namesof characters and the details of certain events, the filmmakers assert their intention to present us with a fictional story rather than a reconstruction of history. Most of the movie’s discrepancies are the result of conscious choices, not errors, and in the context of drama they make pretty good sense. The movie’s approach to slavery, for example, garnered some especially harsh criticism. But I don’t think an American audience could have sympathized with a slaveowning hero, no matter how common the practice in the film’s actual setting. It was a sensible choice to serve the goal of telling a story. Whether or not that story works is a matter of taste, and of the principles of plot and character, action and setting, and all the other factors by which movies either succeed or fail. The world of The Patriot isn’t exactly the same as the world I’ve found in the historical record, but for a few hours, at least, it’s a pretty compelling place to be.